TV show dates: March 4, 2018 — present. Performers include: Alec Baldwin (host). 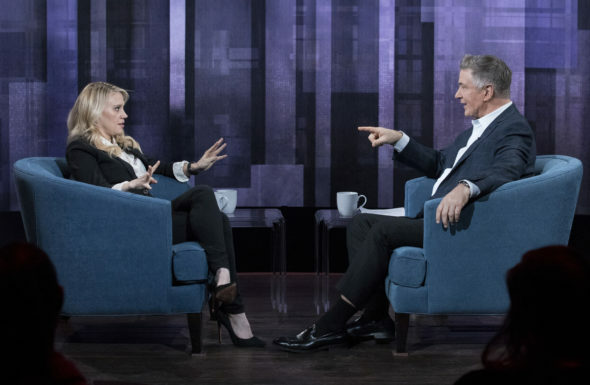 The Alec Baldwin Show TV show (formerly known as Sundays with Alec Baldwin) is an hourlong weekly talk show, hosted by the 30 Rock alum and frequent Saturday Night Live guest star. Baldwin conducts one-on-one interviews with American pop culture luminaries. His inaugural guests were SNL‘s Kate McKinnon, and comedian Jerry Seinfeld, of Seinfeld fame. For years, Baldwin has hosted a podcast version of this format on WYNC. It and the series feature candid conversations and deep discussions. The show hails from Baldwin’s El Dorado Pictures. Jason Schrift executive produces. What do you think? Do you like the Sundays with Alec Baldwin TV series? Should this TV show be cancelled or renewed for another season on ABC? Cancel this show Alec is just not making the grade. Yes, renew. At first I didn’t care for it because it seemed as though Alec interjected too much Alec into the conversations. But it seems now he’s better at letting his guest shine, and Alec interjects to complement the guest which works better. Alec is intelligent, asks good, leading questions, and surprise … he actually listens to his guests and honestly seems interested. That’s really nice. I like the one-on-one platform and the serious, sometimes funny, always good natured alchemy. I also like two 30 minute interviews in the hour. Good show. Good diversion from, let’s say, daily reality. Really? He isn’t funny and is only a one dimensional actor like 90% of the rest of the “entertainers”. Even his cut comedy is poorly done. He can’t hold his own without a script, teleprompter, and some downers so his head doesn’t explode. Find another host to interview the airheads. This show is a total Dumpster fire! ABC. bombs again. How about a cooking competition? Plus he acts like a jerk. Very unlikable. Don’t like Baldwin. Don’t think he is funny in a humorous way. Don’t like the way he talked to his daughter. Don’t like his temperament. He is a hot head loud mouth who is a terrible person. They should replace this garbage wagon of a show with gun smoke re-runs. Looking forward to seeing Alec Baldwin’s new show. I love him on Match Game & love his impersonations on SNL! Think he is really funny! Please don’t cancel the show before people even know about it! I love the nostalgic quality of this show. It was fun, smart, hilarious and well done. I hope it runs for a long time. Bravo. I loved the show with Jerry Seinfeld and Kate McKinnon! I would watch more shows like it.